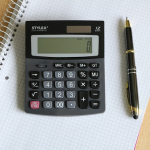 When you purchase glasses online, you will inevitably need to produce your PD numbers. These numbers are not necessarily part of your prescription for glasses and often times, they are not even measured during your eye exam. So what do you do when the website you are ordering your glasses from is asking for them, but you have no idea what they are? In this article, I will show you how to measure your PD for eyeglasses, using nothing more than a few objects we all have at home. 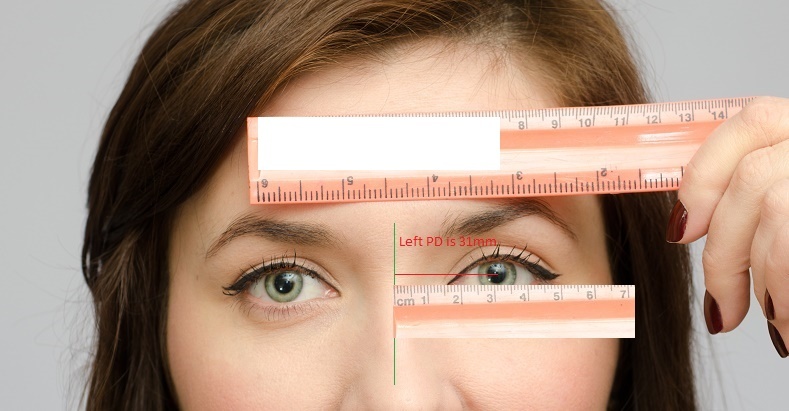 PD stands for the pupillary distance, and it refers to how far apart your eyes are. It is called the pupillary distance because to measure it, you take the distance between the center of each pupil. Why is the PD Important? The PD is required when making glasses because it allows the glasses manufacturers to align the center of the lenses with where the eyes will be behind the frame. 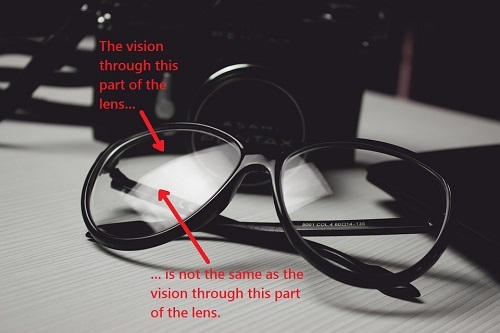 It is important to understand that the vision through lenses is not the same through every part of the lens. For the prescription to be accurate and for the vision to be clear, the eyes visual axis must be looking through the ‘optical center’ of the lenses. 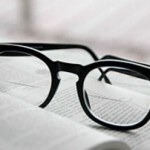 If the PD is not taken into consideration when making glasses, it may result in viewing through a spot on the lens other than the ‘optical center’. This can make the vision uncomfortable. You may experience blurriness, eye strain, double vision, headaches etc. The larger and more complex your prescription is, the more important it is to have accurate PD measurements. When people refer to the ‘PD’ without any other classifiers, they are by default referring to the distance binocular PD. This is the most important one, and it’s the distance between the center of the two pupils when eyes are looking at least 20 feet (6 meter) away. The distance monocular PDs are the distances between the center of the face to the center of the pupil on each side. These are also known as the ‘half PD’s’ but they are not simply the distance binocular PD divided by two! Most people’s faces have slight asymmetry causing the left and right eyes to be at different distances from the center mid-line of the face. The near binocular PD is the distance between the center of both pupils when the eyes are looking at 16 inch (40 cm). Looking at this distance causes the eyes to turn in towards each other slightly, causing the distance between the two eyes to get smaller. 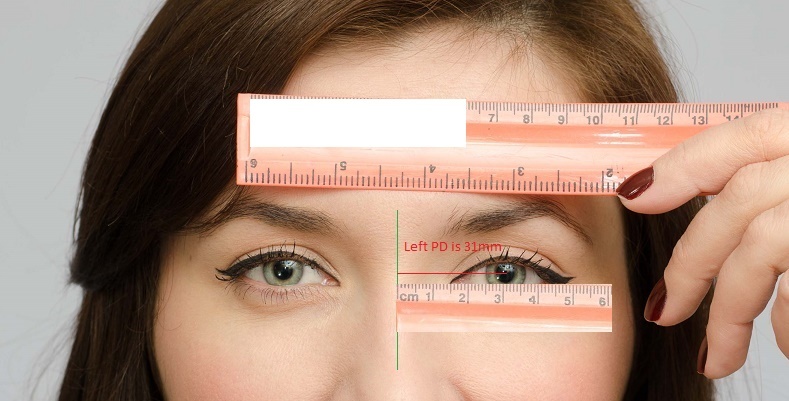 Similar to the distance half PDs, the near monocular PDs (or near half PDs) are the distances between the center mid-line of the face to the center of each pupil when the eyes are looking at 16 inch. Again, these are usually a little asymmetric. Which PD Do You Need To Order Glasses Online? You can get away with ordering glasses by simply providing your distance binocular PD. This is a single number that’s usually in the low 60s, but can be in the high 50s to low 70s. If that’s all you have, it will do. It will roughly align the lenses to your eyes, but it will not be 100% exact. For more accurate glasses, it is better to enter the distance monocular PDs. These are two numbers (one for each eye) that are usually in the low 30s or high 20s. Using the distance monocular PDs will position the clearest part of the lenses (the optical center of the lenses) precisely at the center of your eyes for clearer and more comfortable vision. 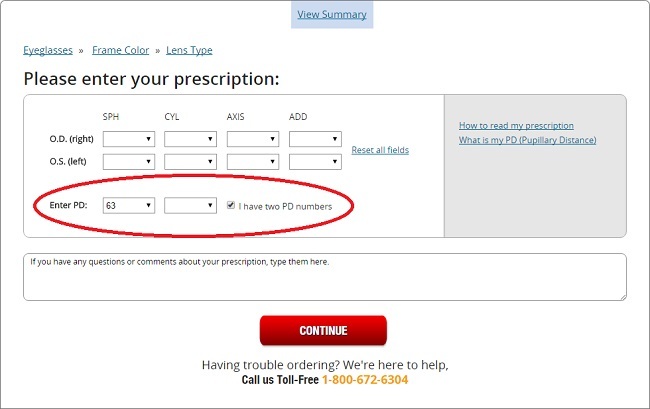 If you are ordering from a website that does not take 2 PD numbers, it may be better to find a site that does. You don’t need any special optometric equipment to measure your PD. All you need is a standard ruler (that shows centimeters) and a camera. Cellphone cameras are fine for this purpose. You will also need to know a little bit about the anatomy of the eyes, which I will cover in this article. 1. Position your ruler against your forehead. Make sure to place the centimeter side facing out (so that it’s visible to the camera). • Try to position the ruler as close as possible to your eyes without obstructing them. • Take extreme caution not to poke your eyes with the ruler. • Try to take the picture as square-on as possible. Avoid taking it at an angle. 2. Have a friend take a picture of you, or take a selfie of yourself with the ruler against your forehead. 3. Upload the picture to your computer and open in it any basic picture editing program. For this purpose, I like to use Paint (for PC) or Photoshop. 4. Cut a rectangle at the edge of the ruler that spans a distance larger than the distance between both eyes. Then drag it down to just below the eyes. 5. Use the mm scale to measure the distance between the center of both your pupils in millimeters (mm). 6. 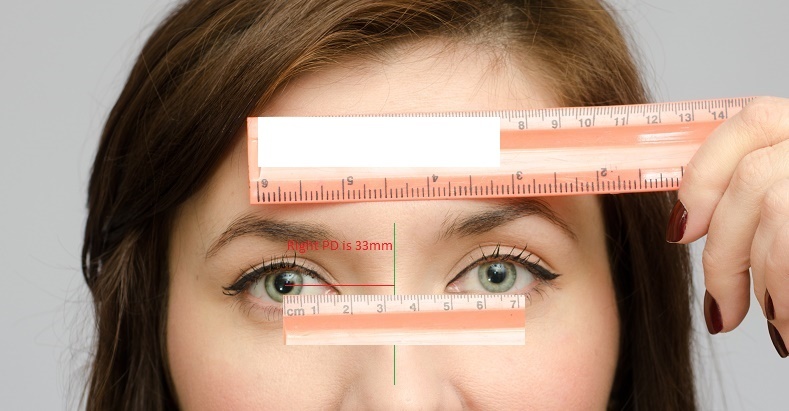 For monocular PDs, draw a vertical line down the very center of the bridge of your nose. Measure the distance from that line to the center of your pupil on the right and the left side. In the instructions above, I suggested that you take a picture with your ruler on your forehead just above the eyes. This is just to make it easier when your trying to measure the distance between your eyes later on in your photo editing program. 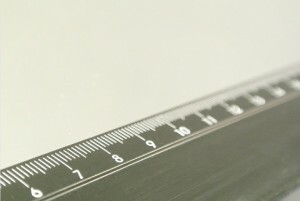 However, if you’re very proficient at photo editing, as long as the ruler is anywhere in the photo and the the scale is visible, you will be able to take the measurement. The only thing you need to keep in mind is to keep the ruler in the same plane of the eyes. Do not hold it away from (or behind) your face. What Are The Near PDs For? The easiest way to do this is to position the camera at 16 inches from your eyes, and stare directly into the camera as you take the picture. Note that in the example above, both near monocular (half) PDs (32mm and 31mm) add up to the near binocular PD (63mm). Also note that in the two examples above, the distance binocular PD (64mm) is bigger than the near binocular PD (63mm). This is what you should expect. If your near PD is larger than your distance PD, you may have made a mistake along the way. To have this explained a different way, check out 39dollarglasses.com’s simplified explanation. Just a year ago I got my first prescription for glasses, which I haven’t filled yet, so this post will be helpful to me. I didn’t realize I needed to know how to measure my PD. I didn’t even know that PD stood for pupil distance. I assumed it would all be covered in the prescription. Sometimes the PD is measured for you during an eye exam, sometimes it’s not. It depends on the optometrist. If you go buy glasses at a physical store, they will measure the PD for you. But if you are planning to buy them online, there isn’t anyone to measure it for you. When that’s the case, you can go back to your eye doctor’s office to have it measured, but if they know that you want it in order to purchase glasses online (which will be obvious because there’s no other to walk in asking for your PD), they might give you a hard time about and charge you an extra fee, make you sign a waiver, etc. This information is provided as an information resource only (i.e., this is not medical advice) and is not to be used or relied on for any diagnostic or treatment purposes. This information does not create any patient-doctor relationship, and should not be used as a substitute for professional diagnosis and treatment. Thanks for this very simplified information! I didn’t even know what PD stood for and I was trying to measure it, so it was nice to have an explanation of abbreviations and ‘optical jargon’ such as PD. I recently purchase some glasses and wasn’t that happy in the long run with the prescription and what I was provided with – that’s why I want to try this myself next time! Ho Kegan, I’m glad you found it helpful! If you had trouble with your glasses, it could have been an issue with the PD, but it is more likely that it was an issue with the prescription. I would recommend having it re-measured before getting new glasses. This is SO helpful. I’ve been getting increasingly tired of buying those reader glasses and know I should probably to get some real glasses. I think I’m holding out for it getting better LOL which it actually does at times, so perhaps a part of it is eye strain but I’m wondering if you’re saying this allows you to get glasses online WITHOUT visiting an eye doc? Wouldn’t they still have to test your vision to figure out how strong the glasses should be. I assume so, but the option of doing anything online where things are more competitive is a HUGE HELP. Thanks so much. Yes, you still have to visit your optometrist to get your prescription for the strength of the glasses. Sometimes your optometrist will even measure the PD for you, in which case, you’re set. If you ask me, there should be a law the required the PD to be on every prescription for glasses. But right now, a lot of times the optometrist will not measure your PD or not write it on your prescription. So when it comes to ordering glasses online, you’ll be stuck if you don’t know how to measure it yourself. Wow Julie, I just learned all kinds of stuff I wasn’t even aware of – thanks for that. I never got my glasses online so I didn’t even know you have do to this. But I was looking it up because I think I’m getting ripped off where I normally get my glasses. I would feel very comfortable taking your advice after reading through your website. Hi Debby, if you want to save money on glasses, online is definitely the way to go. And it’s not necessarily that brick and mortar stores are trying to rip you off that they’re more expensive, it’s just that they have a lot more costs to cover: rent, employees, advertising, etc, etc. Online prices are much lower because that kind of business is much cheaper to operate. I wear contacts for my normal, everyday life. However, I got a pair of glasses along with my contacts the last time I went to the eye doctor. The glasses have just not fit right since I got them, and it’s been so long since I last had glasses I was thinking it was maybe just me. However, after reading your article, I’m now thinking that I have a bad fit. Thanks for the info! Another possibility for why you don’t feel comfortable with your glasses could be from the differences in the vision between contacts and glasses in general. If you have a moderately high- to high prescription, and you haven’t worn glasses in a long time, it will take a while for you to become accustomed to the glasses again. This happens because glasses create distortions in the vision, whereas contact lenses offer more natural vision. Switching between one and the other can cause adaptation problems sometimes. I’m a little confused, what is the difference between the distance and near pd and which one do I need to use for my glasses order? The site I am using just asks for pd, it doesn’t say distance or near. Sorry for the questions, it’s probably simple but I’ve never done this before. Thanks for the tutorial. Hi Rob, it depends on what kind of glasses you were prescribed. If you are ordering glasses for the distance, then you’ll need to provide the distance PD. If you are ordering reading glasses, then you will need to provide the near PD. If you’re not sure, it would be best to ask your eye doctor for clarification (and the PDs). This is so good to know. My daughter needs glasses now and I thought about ordering the next pair online because at the eye doctor they are so high. I am very frugal but I want the best pair for her regardless. How long is a prescription suppose to be for? That is a good question, and the answer is it depends on the optometrist. I have seen many things over the years. Some optometrists make their prescriptions valid for 6 months, most make it valid for 1 year, though I have also seen 2, and even 5 years! Most of the time it will be written somewhere on the prescription. If it’s not, then the place where you get your glasses will be the ones to judge. If they feel your prescription is too outdated, they may require you to update it before they make your glasses for you. On the flip side of that , many optical places will ignore the expiry date for the prescription and make the glasses for you regardless. So really, it depends on a lot of things. This is very helpful. I have seen ads on tv for getting eyeglasses online and was wondering how it worked. I am definitely going to try this. I need new glasses, because my dog chewed my old ones and it seems like you can get some really good deals online. Really informative website. Thank you for providing this information. I work around optometrists and opticians (and even ophthalmologists) and do a lot of tasks for them that they are too busy to do. That’s where I pick up all this stuff. This is very interesting, I definitely learned something new today. Awesome article! I would have never thought that I could do this myself. The photoshop idea was money. I just got my first prescription while I was still in the army last year so having this information this early in my eyeglass usage career will help out a ton for the rest of my life. Really appreciate it! Thanks Jesse, I’m glad you found it informative. Wow! This is some great info. I never knew that so much really went into measuring your glasses. I luckily don’t need them just yet, but my husband has to wear glasses and he says he constantly has issues with headaches etc, due to misalignment. His glasses have the bifocal built in, so alignment is important. Guess it didn’t help that the dogs chewed on them at one point. I can understand why your eye doctor would not be all to forthcoming with this info, cause they know you will go and find glasses cheaper than what it costs to purchase them from them. I do have to ask, would you recommend this for anyone who needs glasses, or those who just require the more traditional single power lenses? I know technology has changed greatly with bifocals etc, so I wonder if that would change how you would do your measurements. Hi Jennifer, that’s a great question! When it comes to lenses called ‘progressive lenses’ (no-line bifocal lenses), depending on the model of the lenses that you are getting, sometimes you need to take many additional measurements for the glasses to come out right. When it comes to ordering progressive lenses, it is better to get help with the measurements. These types of lenses are not cheap and should anything go wrong with them, you want to be able to receive support for them. I’m in the process to get myself new glasses online but this will be my first time and I didn’t know all of this. Now thanks to your website I will make sure that my eye doctor measures this for me. You have a very nice website with very nice and clear images, I love it! Thanks. Hi Gabriel, welcome to the world of ‘buying glasses online’! This is so awesome! I have wanted to order online for some time now but always fail to complete my order due to not having these measurements. The next time I get a prescription I’ll make sure my doc gives them to me. This will help save me money on glasses. Do you have a link for how to mold the ear part of the frames for proper fit, too? Thank’s, Julie, I was searching the internet for information about PD to order my glasses online. I have my prescription and uploaded it to their website only to find out. Like you said it was missing the PD. Your detailed instructions made it easy to get my PD and complete my order. Thanks for the information it was very helpful. This is great information. I have a eye examine coming up and I am sure I am going to need glasses. I was planning on ordering online where I can find a better price, so this info will come in very handy for me if my eye doctor doesn’t provide the info. Thanks so much! If you’re buying glasses online, definitely check out my Coupons Page before you buy. You will find some amazing sales there! Hi Ches, yes you’re right that not everybody will be comfortable enough to it themselves using this technique since it does involve some knowledge of photo editing programs. That’s I’m I’d be more than happy to do it for you. Just leave me a message on here: my fiverr gig.